After being sworn in as the 20th president of South Dakota State University, Dr. Barry H. Dunn moved in to the brand-new President’s Home on the South Dakota State University campus in Brookings. 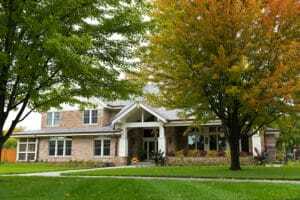 The recently-completed two-level building serves the personal home for the president, while offering accommodations for hosting donors, guests and friends of the university. To add beauty to the structure while also making it easy for the college to care for, DaVinci Multi-Width Slate composite roofing tiles were installed. Specified by TSP Architects for the expansive home, the team selected a Weathered Green color for the roofing tiles to complement the overall design of the building. The crew at Architectural Roofing & Sheetmetal, Inc. installed the sturdy DaVinci tiles on the new structure. “We typically work on several projects at South Dakota State University each year,” says Travis Delker, estimator/project manager for Architectural Roofing & Sheetmetal, Inc. “This was our first time installing a DaVinci roof. We started with a SolarHide underlayment, so we were able to achieve a Class A fire rating for the roofing system. And then, because we average 33 inches of snow annually, we finished by installing snow guards on the building.